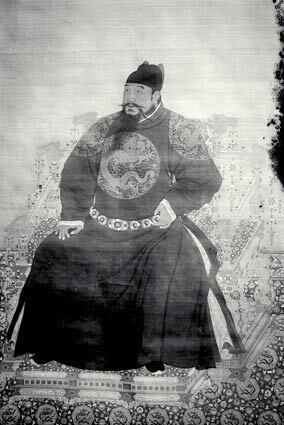 According to Chinese archives, in the fourteenth year of the Ming Emperor Yongle, which was the seventh year of the second reign of the Hilaaly King Dhammaru Veeru (AD 1417), the Maldive King sent an ambassador to the court the Emperor in Nanjing. The Chinese capital was moved to Beijing five years later. In the 10th year of the Emperor Yongle and the 5th year of Xuande of the Ming Dynasty, the merchant fleet led by Zheng He arrived in the Maldives twice. This was also in the reign of King Dhammaru Veeru. In the book Foreign Splendors by Ma Huan in Zheng He's entourage and the book Maritime Marvels by Fei Xin, there are detailed accounts of geographical location, weather condition, local produce, mode of life and customs of the Maldives. The Chinese called the Maldives the Liushan Kingdom or the Liuyang Kingdom. In modern times a Chinese ambassador was accredited to the Eterekoilu (Court of the King of the Maldives) when the ambassador of the Chinese Nationalist Government called the Republic of China based in Taipei presented his credentials to His Majesty Mohamed Farid in 1966. The ambassador was resident in Malé. The Chinese Embassy was the first diplomatic mission opened in Malé in modern times. Diplomatic relations with the Central People's Government of the Peoples' Republic of China based in Beijing was established in 1972.